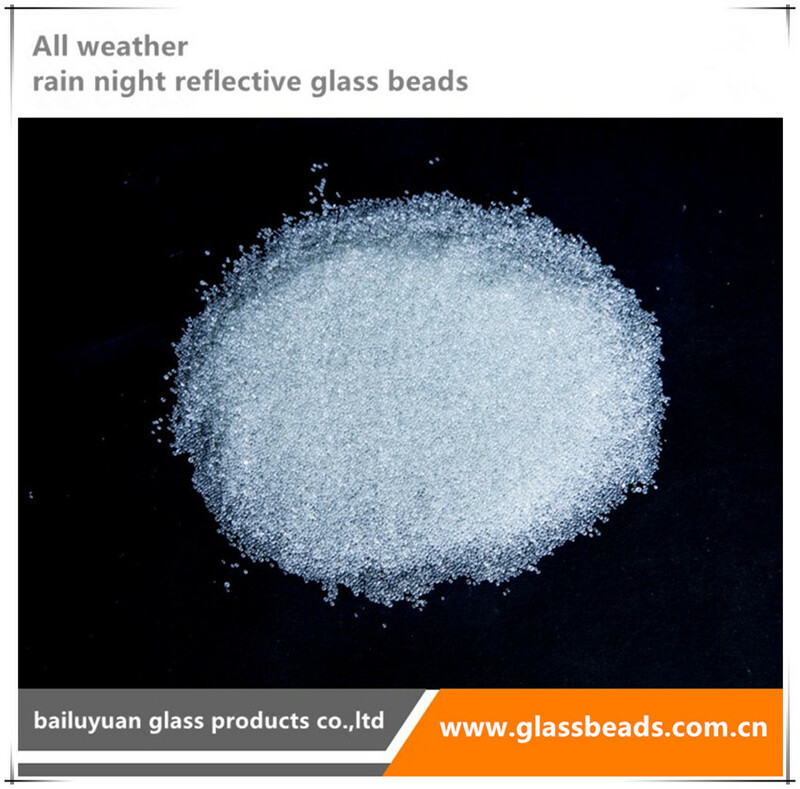 Home > Products > All-weather Rain Night Reflective Glass Beads > Glass Beads are Night-visible. Quality glass beads that provide good, consistent retroreflective values in all conventional road marking materials. used for inter-mix glass beads, Road Marking Intermix Glass Beads or drop on glass beads, Road Marking Drop-on Glass Beads application and produced to meet all necessary specifications. High quality Wet Night Retroreflective Glass Beads, Rainy Night Reflective Glass Beads that provide extraordinary reflectivity values due to imroved rounds and smoother bead surfaces. we are particularly suitable for demanding performance and warranty specifications and can be applied on all binder systems with impressive results. As roads get wet and boundaries can be barely seen, driving in rainy nights is very difficult, which increases the probability of traffic accidents by more than 3 times. 75% of the traffic accidents happened during the rain, All Weather Reflective Glass Beads makes a new kind of all-weather road marking in acute demand. thus it has become an urgent subject to guarantee the excellent retroreflectivity of road markings in both sunny and rainy dark condition. All-weather reflective glass beads , High Reflective Night Reflective Glass Beads for road markings is a brand-new concept of retroreflective material. All Weather Glass Beads For Road Marking can greatly improve the security level of road markings, and overcome the defects of traditional markings. Rain Night Reflective Glass Beads reflectivity is excellent no mattter during the day or in rainy nights, which helps to make sure vehicles in line to ensure drivers' safety. Rainy Night Glass Beads For Road Marking is the updated version of ordinary glass beads, it's ideal beads for highways, mountain highways, urban roads, taxiways, runways and airfields. 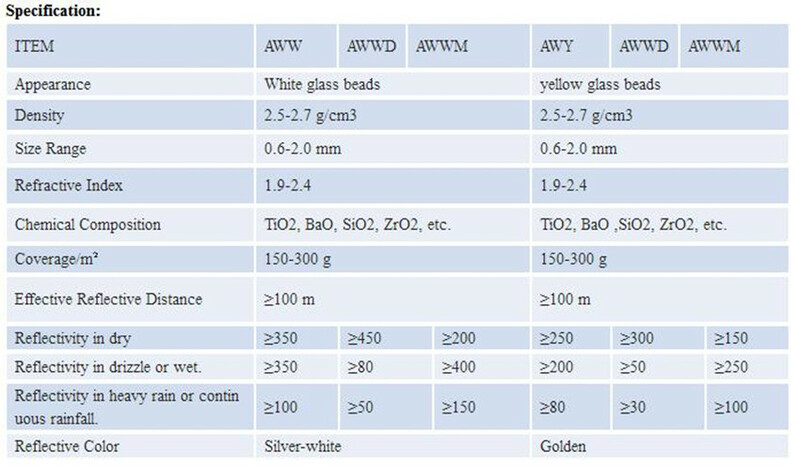 Rain night reflective glass beads bring out the best in any marking material without changing construction equipments. it's suitable for hot-melt coating, double component coating and water borne paint, and ect. Rainy Night Glass Beads For Road Marking combined and covered by non-transparent micron beads. Excellent optical design provides superior retro-reflectivity in dry and wet conditions. Reasonable structure design, high compressive strength, Glass Beads Special Rainy Night Road, good flowability improves uniformity of drop-on and good adhesion with various paint. Long reflective distance, and various reflective colors. Variety of drop-on for reflective road marking. Variety of intermix for reflective paint. Drop-on for reflective anti-slip/anti-skid road marking. Paper bag, 25 kg (55 lbs)/bag. Looking for ideal Solid Spherical Glass Beads Manufacturer & supplier ? We have a wide selection at great prices to help you get creative. All the Wet Night Retroreflective Glass Beads are quality guaranteed. We are China Origin Factory of Wet Night Rain Night Glass Beads. If you have any question, please feel free to contact us.